Let Wild Vistas Trekking help you create the adventure trip of a lifetime. Wild Horizons specializes in creating journeys that fit your specific interests, calendar and budget. Whether it’s a family hiking trip through Yellowstone National Park staying in beautiful hotels each night or a rugged backpacking trip through the wilds of the Grand Canyon with your seasoned outdoor friends, Wild Vistas Trekking will help you create the perfect adventure. Wild Vistas Trekking specializes in personalized trips. We'll help you create a trip of a lifetime even if you're the only person booking the trip. You can create a trip to any of the areas listed in our trip schedule at a time convenient for you. 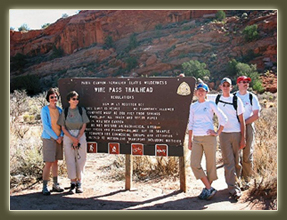 Wild Vistas Trekking also offers special pricing for Family Trips. Simply fill out and submit the form below and one of our representatives will contact you to help put together your trip. You will have the opportunity to review your information for accuracy. Please enter any additional information below that will help us design your trip. Wild Vistas Trekking will contact you with availability and to fine tune your request. The information you provide will not be shared with anyone else and will not be used by Wild Vistas Trekking for any solicitation other than to discuss this specific request.